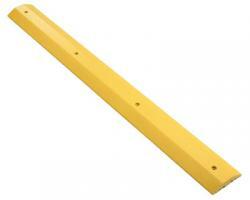 Available in Safety Yellow with bottom channels and pre-drilled mounting holes. Special Order colors are available – Contact Sales for more details. Slight color variations may occur from one production run to another due to variations in recycled feedstock and standard allowable tolerances on colorants used in the manufacturing process. Composition: SOLVE speed bumps are solid, non-hollow, foamed recycled products manufactured from recycled Type 2 High Density Polyethylene (ReHDPE), with no fillers. The composite mixture of the end product is at least 90% ReHDPE, utilizing both post-consumer and post-industrial materials. The plastic is impregnated with colorant and UVI to help protect the material from physical degradation, flaking and color fade. SOLVE plastic extrusions are non-commingled “pulltruded” products. This promotes a network of complete molecular linkage. Evolve products are able to sustain normal loadings at temperatures ranging from -40°F to 110°F with proper installation. SOLVE speed bumps are manufactured using only heavy-metal free colorants, to be environmentally friendly, and to meet current and future federal standards. Lead Time: 2-4 weeks before shipment. This item is "Built to Order".